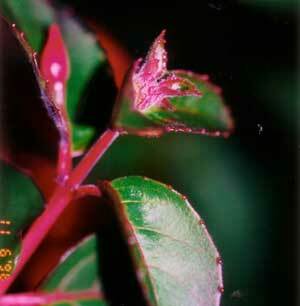 Fuchsia gall mite (Keifer) from Brazil was first described in 1972. In 1981 fuchsia mites appeared in California where they spread rapidly and decimated the fuchsia industry. By 2003, growers in Brittany, France, had infestations. Today they are in the UK as well. 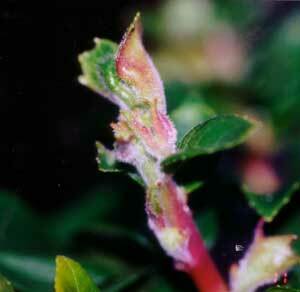 In the Pacific Northwest, fuchsia gall mite had infested plants intermittently over ten years. Then in 2004 & 2005, serious infestations were found in gardens from Tacoma to Portland, presumably because of warm winters. By the summer of 2006, following a cold winter, no damage was found on any winter hardy fuchsias in the gardens. The mites froze. The Northwest Fuchsia Society (NWFS), primarily in Western Washington & Oregon, USA, compiled and distributed information on fuchsia gall mite and how to minimize the problem-- before it got out of hand. Using California’s 20+ years of experience and with input from Northwest growers, dealing with fuchsia mites effectively should be possible when gall mite problems occur again in PNW yards and greenhouses. Information on this site will be updated as more is learned. >Plant parts (leaves, flowers, stems) are fused together, twisted, & swollen, forming galls. .
>Infected areas may look hairy with reddish and whitish areas. Early detection- new leaves thicken, redden, become hairy, & chunky galls and lumps appear. Gardeners suspecting fuchsia gall mite and wanting to verify this, should cut off an affected part of the plant, place it in a Zip Lock bag, and seek assistance from a local fuchsia group or the county Extension Office. Do not assume that because some leaves are curled or unhealthy (aphids and other insects can cause this!) that the plant has gall mite. The life-cycle of Aculops fuchsiae is 2-4 weeks with four stages: egg, larva, nymph, adult. The females lay ~50 eggs at one time, and in 1-2 weeks, they hatch. (If even half of those 50 eggs produce baby mites , in no time at all, there are hundreds!) The wee mites are expert at hiding in plant structures to avoid danger, and controlling them is difficult but not impossible. Dr. Carlton Koehler, et al, entomologist, Urban Pest Management, U. of California, AFS Bulletin, Aug., 1985. Bayer, Ortho, Sunspray & Sevin product labels.